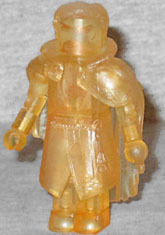 Astral Form Doctor Strange is, unsurprisingly, the same figure as Doctor Strange, just cast in translucent yellow plastic instead of his various colors - the same pieces, the same paint masks, the same everything, just a glowy yellow instead of red and blue. Come to think of it, there are two differences: one, this Minimate doesn't come with the spellcasting "shield" hands, and two, his hands don't have the scars painted on his fingers. Apparently Doctor Strange's soul did not get injured along with the rest of him (or it's already healed). Technically he shouldn't have his cloak, so it would have been nice if they'd swapped that out for a hover stand. Remember when we said that Kaecilius' role in the comics was nothing like what it was in the film? To give you an idea, this guy in the movie was basically what Kaecilius was in the books: a henchman for somebody else with no sort of motivation of his own. The purple robes are nice, with two different shades to create the look of layers. The skirt portion is molded, but the rest is just paint, including the bands on his wrists. 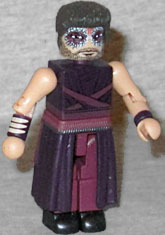 This Minimate represents Scott Adkins' second comicbook role, and again he has weird dark patches around his eyes. Is that some kind of weird typecasting? At least he gets a mouth this time. This entry was posted in Art Asylum, Marvel, MMMR and tagged Dr. Strange, Minimates. Bookmark the permalink.